Have you been hearing about this product and wondered if it worked? Well let me be the one to say "yes indeedie". 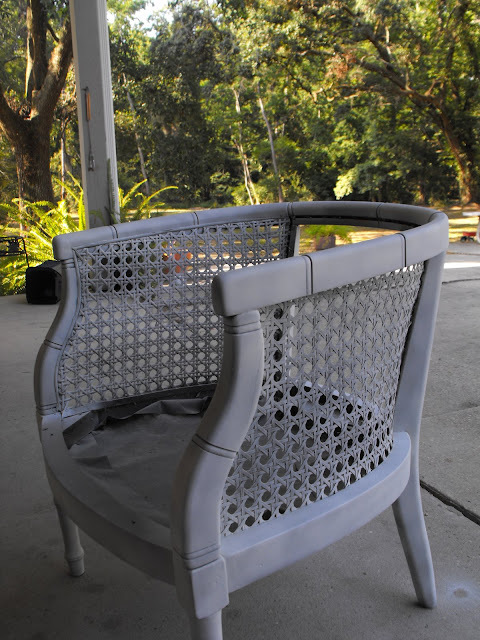 I knew I needed to sand the chairs but just how in the world do you degloss wicker. You use deglosser! Have you wondered what it looks like and how do you apply it. Well wonder no longer. 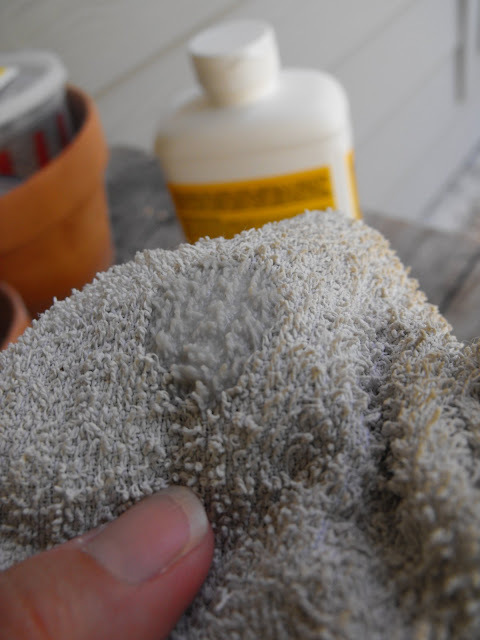 It looks like watered down glue and you just pour a bit into a rag and rub your surface down. 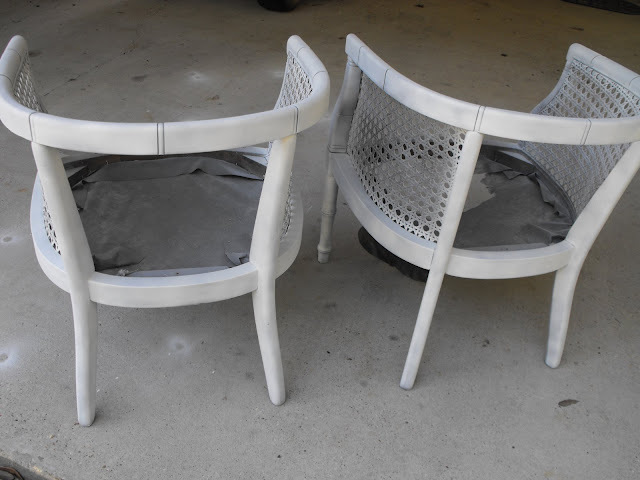 The chairs felt a bit tacky after the first coat of deglosser but as it dried the tacky'ness dried as well. So easy! I have already gone through 6 cans of spray paint and will hopefully finish up with one more can tomorrow. I had no idea how much paint wicker can soak up. So here is where the fun comes in....fabric for the covers. I'm not sure where these babies will end up and I'm sure wherever they do they wont stay long. So with that very long sentence being said ...I want to cover them in a fabric that will work throughout the house. Any ideas would sure be welcome! I can't wait to see the finished product. They already look amazing! I just found your blog, while blog hopping. I have been wondering if any of those liquid sanders work, thanks for the tip. Your chair are turning out just great. I can't wait to see the finished product. I am adding you to by bloglist and your follower list. Looking to seeing them all finished! THey look really nice all white! Enjoy your day! Can't wait to see what you choose for the fabric. I'm sure it will be simple and elegant, but comfy at the same time. That's just how you do it! Keep us posted, they look 100% better already! How about a taupe or off white linen fabric? they already look amazing! I can't wait to see what you come up with ~ I'm sure it will be amazing! Thanks for the info, Susie! We picked up a couple of things at the garage sales, Friday, we'll be working on. I think this might work on the tops, as well as the other surfaces of the furniture we have. The chairs are going to be gorgeous!!!! OOH! I'm so excited!! These twins are looking good! Suggestions for use all around the house - a natural color in a microfabric....a beige toile is always a good neutral choice.....a light neutral color in a canvas would mean you could use indoors or out. Because of the depth of the chairs, you could use colorful throw pillows to line the back to change the look as you move from room to room to room. They are gorgeous. I think a ticking would be perfect as this goes with everything, you are not a floraly person (I don't think)so what do you think about ticking or definitely a neutral toile. Just an idea. Very nice! I can't wait to see the fabric you choose. I'm guessing damask. How exciting!! I can't wait to see them all finished! can't wait to see what you choose! the comments left are great and I really like the unbleached muslin idea! keep us posted!! I think burlap or a linen fabric would be pretty. They are looking so much better! Hmmm, old grain sacks, linen, velvet in another soft, neutral palette. I am so excited to see how these turn out!!!!! I have missed so many posts! Rest assured, I haven't gone anywhere! SIX cans??? Wow! I didn't know wicker was that hard to cover, either! But I know you will find the perfect fabric. Thanks for telling us about the deglosser/liquid sander. I have some stuff I need to redo that I just didn't think I'd be able to get into the curves of the spindled legs with sandpaper. I don't even know if that sentence made sense but you know what I'm talking about. Anyway, that liquid sander may just do the trick! Can you get it at Wal-mart or do you have to go to Lowe's or Home Depot? Marc bought it at Lowes but Im sure you can find it or something close at Wal Mart. Happy sandin'! They already look better. :) Can't wait to see how everything progresses! They are looking good! I think white fabric would look great! Or a linen fabric and then you could add color with pillows. I can't wait to see! I really like the "fabric" you have as blog wallpaper (toile)? Perhaps a version of that in latte colors (creamy white & mocha/tan)? ThanX for the visual on the de-glosser. I've been curious about it too. I'm throwing a big high five your way today for talking about the liquid deglosser. 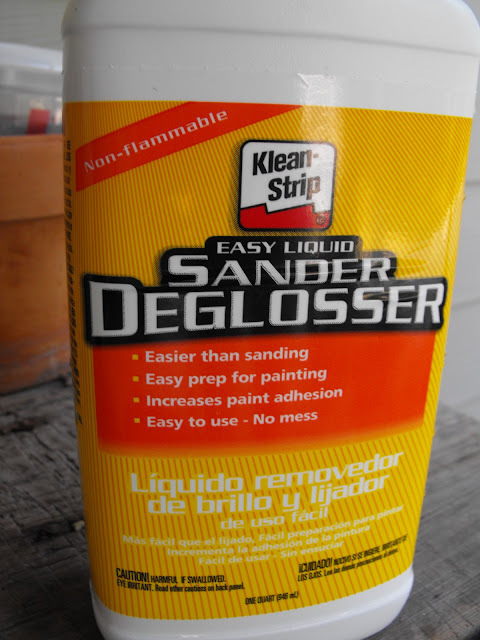 I've been on a hunt for a liquid deglosser/sander here in Canada, and would you know that I can't find it anywhere! I'm heading to the States in a couple days and plan to scoop up some. I hate the noise of sandpaper...it sends me through the roof! I like your blog background and think that a fabric like that would be so pretty for your chairs. Those chairs are looking FABULOUS!!! I'm glad to read that the deglosser works. I just was telling my husband that I need to get some to degloss some of the wood trim in the house that I need to paint white. I thought about trying that de-glosser on my bench, but wasn't sure if it worked. Now I know, thanks Susie! I love someone above's idea to use linen or canvas for the seats, nice and neutral and light for your new decor?